I wanted to share with you one of my very favorite Easter dishes- it's a recipe I've been making the last few years. I originally saw this recipe in Cooking Light in the April 2007 issue. You may never want to eat a traditional deviled egg again after trying this. Stuffed with the best of the best: bacon, shrimp and herbs, it is a mini meal in itself! Best of all, it's easy on the calories too- you can have 2 halves, and it's only 83 calories! Put eggs in a sauce pan and cover all the eggs with cold water. Cook until water begins to boil, then cover with lid, and turn temperature to low and simmer for 16 minutes. Once they are done cooking, carefully pour hot water out of the pan and replace with ice water to set the eggs. You may need to replace the cold water a couple times. You can either refrigerate the eggs for a couple hours or over night. Cut the eggs in half lengthwise and remove the yolks. Place 4 yolks in a medium bowl and reserve the remaining yolks for another use. Add potato flakes and next 6 ingredients (through red pepper + bacon) to the yolks, stir well. Stir in chopped shrimp and parsley. Spoon approximately 1 tablespoon egg mixture into each egg white half. Yum--the shrimp I bet makes these extra good. I'll have to try this--even though my husband is very allergic to shrimp :( I'll have to make some no shrimp ones for him! Ummmm - yum!! Added this to my Easter Pin board. 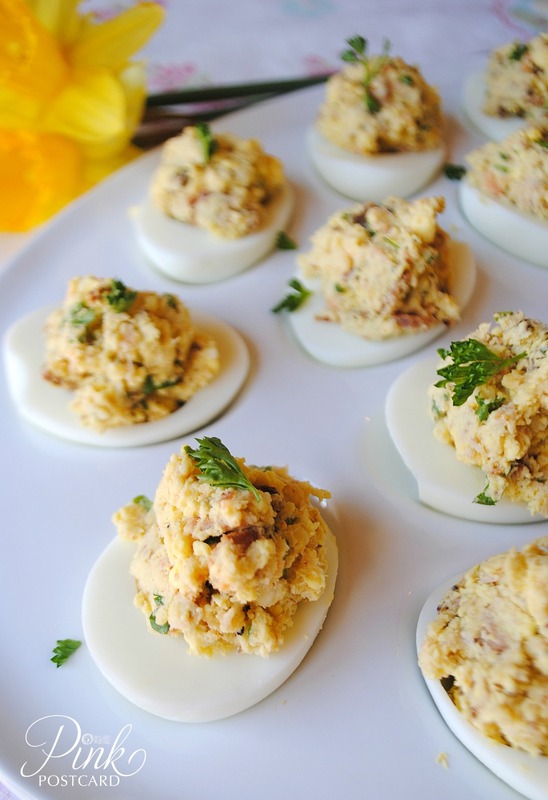 I may make these for our appetizer Easter Sunday.